Houston Texans defensive end J.J. Watt (99) leaves with an injury during the first quarter against the Kansas City Chiefs at NRG Stadium. Five games into his return campaign, J.J. Watt suffered an injury that left him in tears and his team without its emotional leader and top defender. The defensive end exited the Houston Texans' game against the Kansas City Chiefs on Sunday night after a left leg injury in the first quarter. He was helped off by trainers and later was carted to the team's locker room. 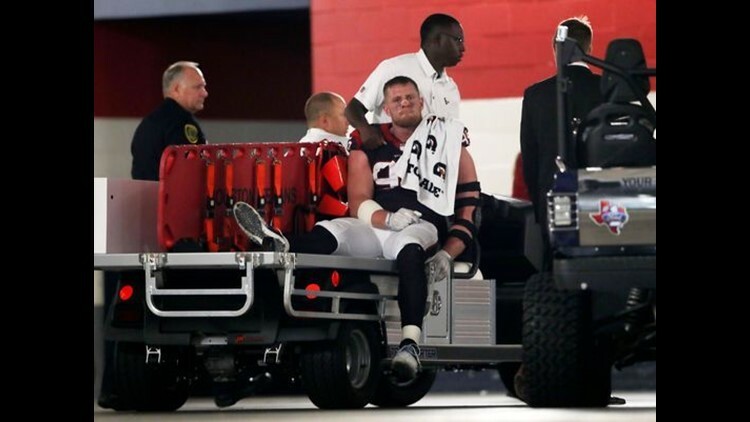 The team said Watt had been diagnosed with a tibial plateau fracture in his left leg. Injury Update: DE J.J. Watt has suffered a tibial plateau fracture to his left leg. NFL.com reports Watt will be out for the rest of the season and placed on injured reserve. #Texans JJ Watt, who the team just announced has a tibial plateau fracture, is out for the season, source said. Another year ended on IR. Texans coach Bill O'Brien confirmed that on Monday. After being ruled out for the remainder of the game, he was later seen on crutches outside the locker room before being loaded onto an ambulance. Early Monday morning, the Texans star tweeted: "I can't sugarcoat it, I am devastated. All I want to do is be out there on that field for my teammates and this city. I'm sorry." Watt underwent multiple back surgeries last year and missed all but three games in 2016. Linebacker Whitney Mercilus was also ruled out after suffering a chest injury.